Copenhagen, Charlottenborg, Fransk Malerkunst, 1918 Lausanne, Palais de Beaulieu, Chefs d’oeuvres des collections suisses: de Manet à Picasso, 1964 Paris, Hôtel de Ville, Paris sous le ciel de la peinture, 2000, p.113, illus. retreating banks of the Seine, motifs where the light is magnificent’ (). With these evocative and poetic words, Pissarro describes perfectly the present painting: motifs where the light is magnificent. Indeed, from his window, Pissarro could contemplate the Seine river, flowing in front of his hotel, from east to west (or from right to left). As the artist explained to his son, in order to execute the painting, he would have turned left, focusing on the Seine, and on the opposite bank (the rive droite), he could see the Tuileries Gardens, next to the Louvre. The ‘magnificent light’ effects resulting from this exquisite vantage point, is, indeed, marvellously captured in this work. of what Pissarro could see. The first sub-group, looking sharp left, is comprised of four paintings, including the present painting: these works depicting the quai Voltaire, extended by the Quai Anatole France and divided by the Pont Royal, captured under various weather conditions (). 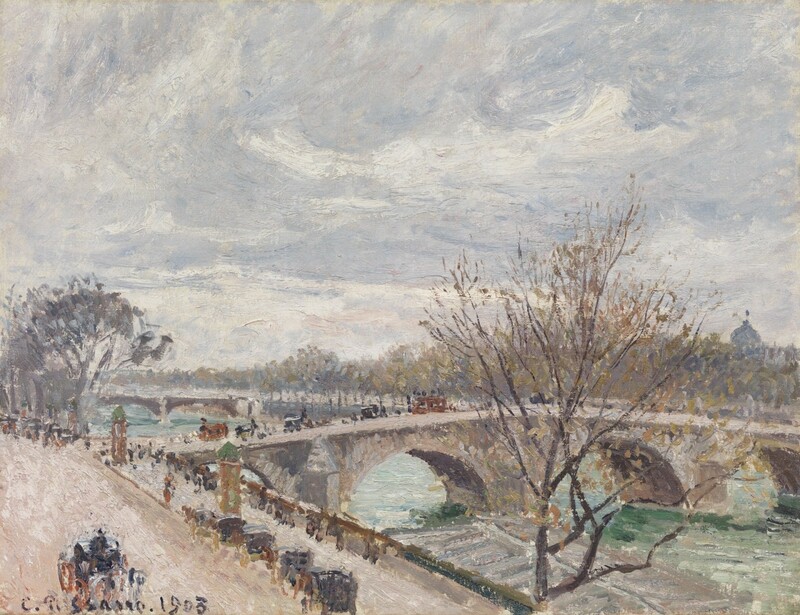 Shifting gently to the right, in the second sub-group containing three paintings, Pissarro almost omits the quai Voltaire from the visual field and focuses on the Pont-Royal as it leads onto the right bank, with the Pavillon de Flore monumentally featured in the background (). Gazing further right, Pissarro leaves the opposite bank, returning to the left bank through a different bridge, the Pont du Carrousel. This third sub-group of two paintings shows the façade of the Louvre on one side of the bridge, and a segment of the Quai Voltaire in the lower right corner (). In the fourth and last sub-group comprised of five paintings, Pissarro has shifted his gaze sharp right and focuses on one arch of the Pont du Carrousel with the corridor of the quai Malaquais next to the Seine and the recognizable dome of the Institut de France in the background (). The present painting is one of his most successful within this series: the slightly overcast weather effect on the Seine is couched in a subtle harmony of rich shades of blues and greens, mixed purple and mauve undertones, which capture admirably the silvery reflection of the light, filtered through the clouds, on the surface of the Seine river. the more why Pissarro would have been especially drawn to the scenery outside his window. Camille Pissarro was perhaps the greatest propagandist and the most constant member of the Impressionists and the only one to participate in all eight of their exhibitions. Born in 1830 in the Danish colony of Saint Thomas() in the West Indies, of Sephardic Jewish parentage, he went to school in Paris and then worked in his father’s business for five years. Ill-suited to being a merchant, Pissarro decided to become a painter, studying at the Ecole des Beaux Arts and the informal Académie Suisse. He was considerably influenced and encouraged by Corot and to a lesser extent by Courbet. During the 1860s Pissarro exhibited at the official Salons and in 1863 at the Salon des Refusés. He increasingly associated himself with the Impressionists, especially Monet and Renoir, and with the outbreak of the Franco-Prussian war in 1870 fled to London, where Durand-Ruel became his principal patron and dealer. After the war, Pissarro returned to France and settled at Pontoise, spending much time with Cézanne, whom he directed towards Impressionism. In 1884 he moved to Eragny. During the 1890s the meadows at Eragny-sur-Epte, looking across to the village of Bazincourt, became one of Pissarro’s principal subjects, painted at different times of the day and year. In 1885 Pissarro came into contact with Seurat and Signac and for a brief period experimented with Neo-Impressionism. The rigidity of this technique, however, proved too restrictive and he returned to the freedom and spontaneity of Impressionism. From 1893 Pissarro embarked upon a series of Parisian themes, such as the Gare St Lazare and the Grands Boulevards. He continued to spend the summers at Eragny, where he painted the landscape in his most poetic Post-Impressionist idiom. Pissarro died in Paris in 1903. Correspondance de Camille Pissarro, ed. Janine Bailly-Herzberg Paris 1989, vol. V, no. 2011. Pissarro and Durand-Ruel Snollaerts, op.cit., no.1486, 1495 and 1496. Ibid., no.1488, 1493 and 1494. Ibid., no.1490, 1491, 1492, 1498 and 1499. Today part of the US Virgin Islands.